Including NEMA Type 7 & 9. For dry indoor use. Only Do not immerse the heater in water. Turn off or not use the heater in places where it is exposed to rain or snow. Fan Aluminum sheet. Spin and steel core with 5/8 “(15.875 mm) hole. Blower protection Two-piece design by late lowly. Mounting holes Four 16 mm diameter holes at the top of the heater. Heaters Three pieces with a long life, low watt load, with high quality metal sheathed elements. Temperature protection Automatic reset type, snap-action bimetal, open exceeded maximum allowable temperature. Nominal 100,000 switching operations at a current of 10 A. Switching current: 0.13 A. Optional built-in thermostat Explosion-proof. 2 ° C to 28 ° C.
Control current transformer Suitable for various input voltages, secondary 115 Volt, 25 VA.
Housing material 1.90 mm steel. Epoxy coated with 5 phases of existing treatments, including iron phosphate. Core Steel with integrated aluminum ribs, vacuum filled and hermetically sealed. Overpressure protection Setting: 690 psi, pressure reduction via trickle down through the pressure relief valve, aluminum housing, replaceable only by the manufacturer. Operating temp. reach -20 ° C to 40 ° C.
Storage constraints -45 ° C to 80 ° C, a short time to 120 ° C. Do not immerse the heater in water. Turn off or not use the heater in places where it is exposed to rain or snow. 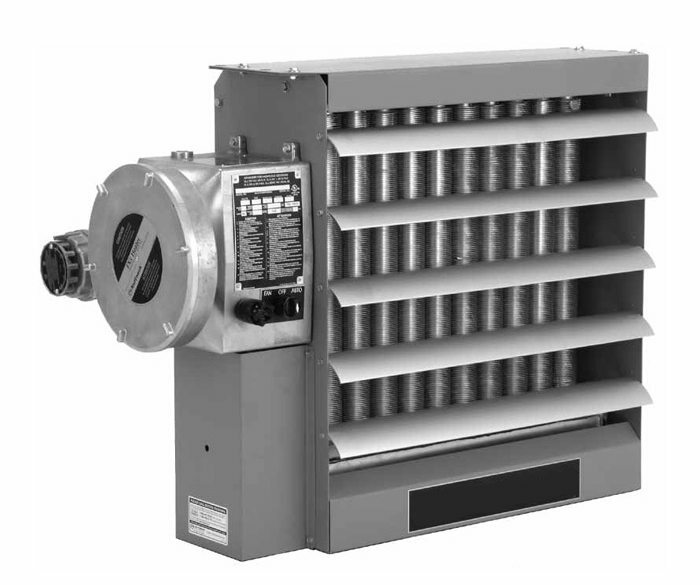 All FE2 heaters are equipped with VacuCore ® Liquid-to-air heat exchanger. The sucked air in the sealed core provides greater efficiency, faster warm-up and distribution of heat across the front of the heat exchanger. If necessary, the entire work can safely and easily be replaced by a new unit or conditioned. The inside of the heater is mounted in a rugged, epoxy coated, 14 mm thick casing in which the motor and fan assembly. The adjustable slats ensure the control of the air flow direction. A two-piece protective grid with small opening provides protection for all moving parts to the rear. All clips are galvanized to prevent corrosion. All aspects and details of the FE2 during the design and development subject to intensive technical analysis and testing. , And are manufactured on the basis of a registered quality assurance program. As a result, the heaters have their safety and reliability amply demonstrated. The FE2 heaters can be hung in various ways. For this purpose, various brackets available.